Canada and Britain have had long and deep ties since the French were forced out of the country and it became a British possession. For thousands, emigration to Canada offered the possibility of a new life, and it proved especially popular amongst the Scots, many of whom were forced from their homes during the clearances of the Highlands and sought freedom elsewhere. Canada could be as wild and freebooting as the American West of legend - something that's often forgotten these days. It's a massive country, and one that's still only sparsely populated, especially in the prairies that form the Canadian heartland. As you might expect, there are plenty of genealogy resources for those seeking to trace family members in Canada. The best place to start is on the Internet, which has many sites that hold detailed information on people to help fill out a family history. However, if it's simply records on an ancestor you're after, then go directly to the Canadian Genealogy Centre . The Centre includes all the online and physical online genealogical services of the Library and Archives Canada. They offer Canadian genealogy content, advice, services, research tools in both official languages (French and English). It's an excellent genealogy resource, with access to AVITUS, a directory of Canadian Genealogical Resources that enables you to access databases, catalogues and Web sites regarding genealogy finds and collections all over Canada - perfect for a anyone assembling a family tree. It also has links to AMICUS. The national catalogue, does not just show the published materials, which can be found at the Library and Archives Canada (LAC) but also shows those located in over 1300 libraries across the country. There's also the General Inventory, which offers a developing view of the Archival holdings of Library and Archives Canada (although it's not currently being updated), and the Government of Canada files (the database contains about 1,2 million descriptions of files created by departments and agencies of the Federal Government of Canada including over 50,000 digital images). These lists are helpful for anyone interested in the federal government records, they are kept at the National Archives of Canada. Descriptions are mainly written in the language of the creator, with most descriptions in English), and finally there's Archives Canada, which is essentially a gateway to archival resources found in over 800 repositories across Canada. 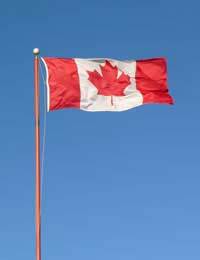 As with the U.S. and Britain, there are pay genealogy sites for Canada, all aimed at the burgeoning family history market. The biggest is Kindred Trails, which gives access to most of the records you'd need, and also offers a 14-day free membership. It has birth, marriage and death records, census information, voter and tax records, as well as obituaries and other sources, a wealth of genealogy data on your Canadian ancestors. A quick browse through any search engine will also give you sites for many local societies and record archives, both on provincial and county levels.